You’re busy. There’s no doubt about that. From running errands to running on the treadmill, commuting to work, attending social events, hosting get-togethers, and everything else you somehow manage to squeeze into your daily schedule, you have a lot going on. And so, as you scramble between commitments and inevitably fall short on energy (and sleep), you need a little caffeine to get you through the day. You need one of the best coffee makers for people on the go. The best portable coffee makers are small, but reliable. They’re efficient, yet not too bulky or expensive. And most of all, they can be packed, transported, or even shoved into a briefcase or suitcase, if need be. After scouring different sites, products, and sampling quite a few on-the-go coffee makers myself, I’ve gathered this list. Whether you’re looking for something high-end or budget friendly, something that comes with a built-in mug or literally becomes a mug, or perhaps a maker that’s big enough for more than just one cup, there’s a product that will work for you. Hopefully you can find something that fits your lifestyle so you can spend less time prepping your coffee, and more time actually enjoying it. 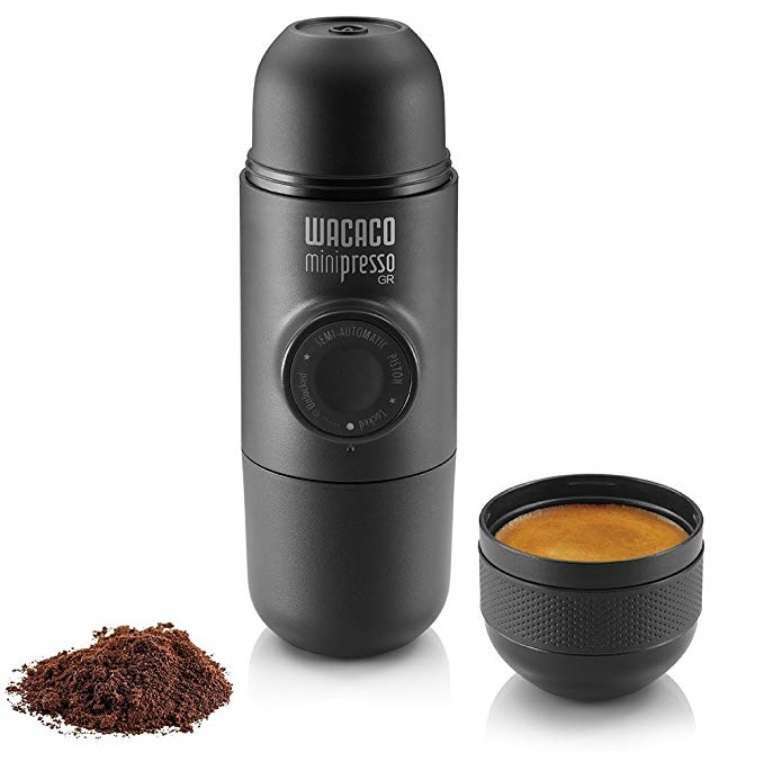 When it comes to portability and efficiency, this Wacaco Minipress can’t be beat. This coffee maker can be used with any coffee bean or roast and doesn’t require any electricity, external cords, or compressed air. It’s used by hand—great for on-the-go use! The entire body stands just under 7 inches tall and weighs less than one pound. Plus, it makes about 50 ml of espresso, so it’s perfect for one person. 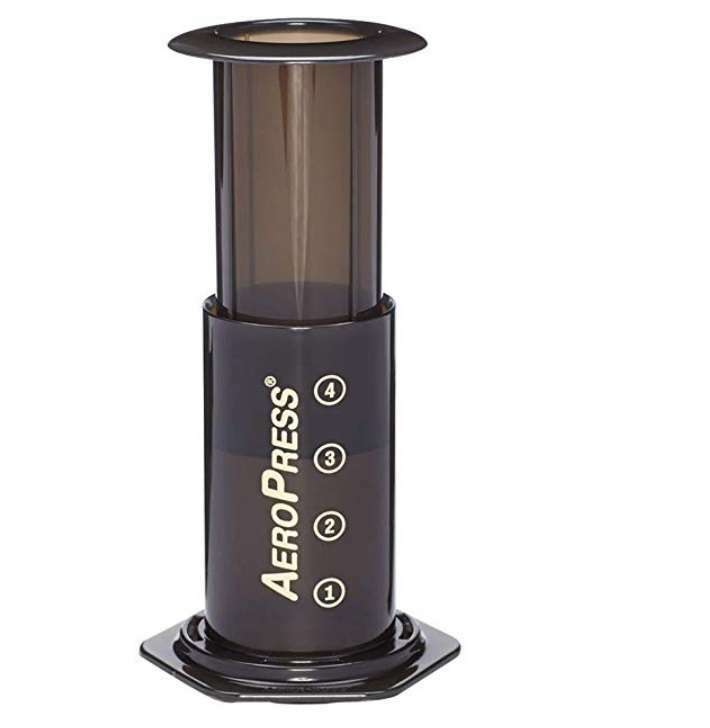 Highly rated by coffee-consumers, this AeroPress Coffee Maker uses total immersion to create coffee that’s rich in flavor. Big enough to make an espresso shot, a 10-ounce cup of coffee, or even a full carafe (in less time than it takes to make drip coffee!) this coffee maker combines low temperatures and quick brew time for an overall less acidic taste. This maker is also slightly more compact than the above, so it’s arguably even easier to stash in a purse, bag, or suitcase. 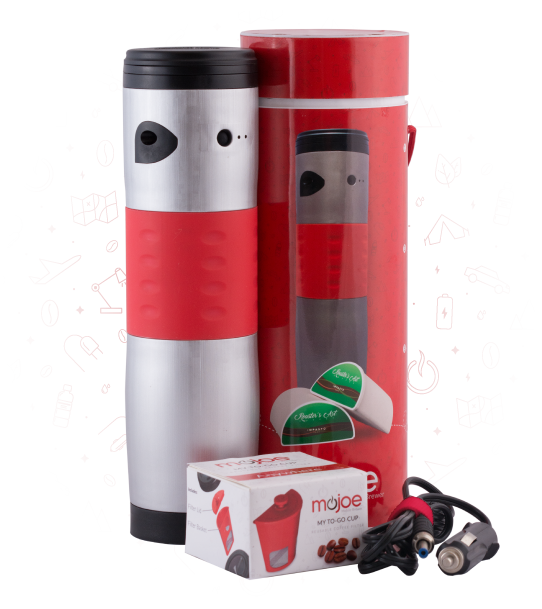 This coffee mug by MoJoe is so mobile, you can literally brew your coffee in the car. (Seriously!) With car charging cable and technology that allows for any temperature water to be poured in for brewing, you can grab anything and make your coffee happen. There’s a reusable filter for the mug, plus a built-in spoon. The maker also comes with an LED light system that lets you know when your coffee is ready, too hot, or at drinking temperature. And the mug is cup holder size, too, for drinking and brewing (literally) wherever you are. 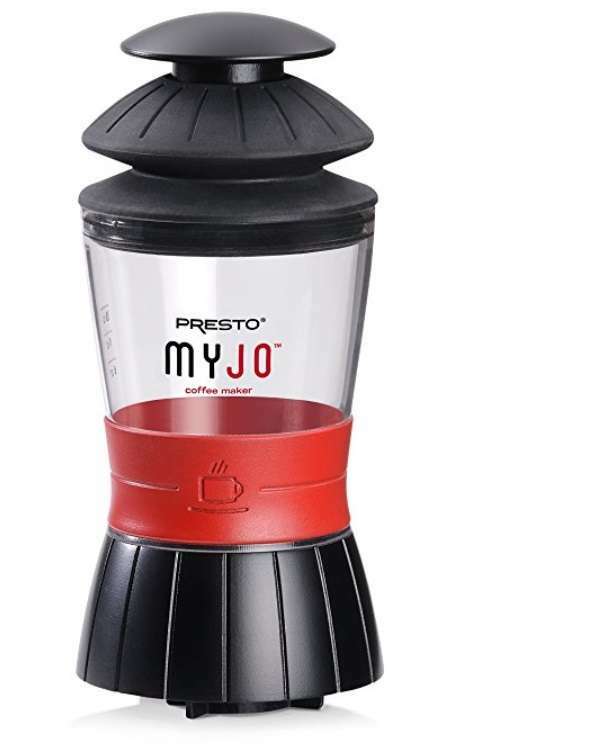 This single-cup coffee maker by Presto is essentially a mini-Keurig. If you’re someone who prefers single-cup machines, or if you’re only looking to brew for yourself or one person at a time, this makes the most sense. 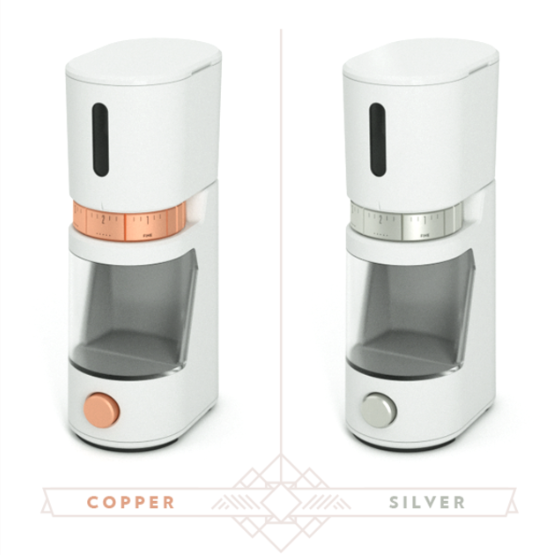 Designed to work with Keurig cups (or regular ground coffee, too!) this maker works by adding hot water and hand-pumping. A lightweight 14 ounces and less than 5 inches tall, it’s perfect for traveling, camping, or the day-to-day movement! 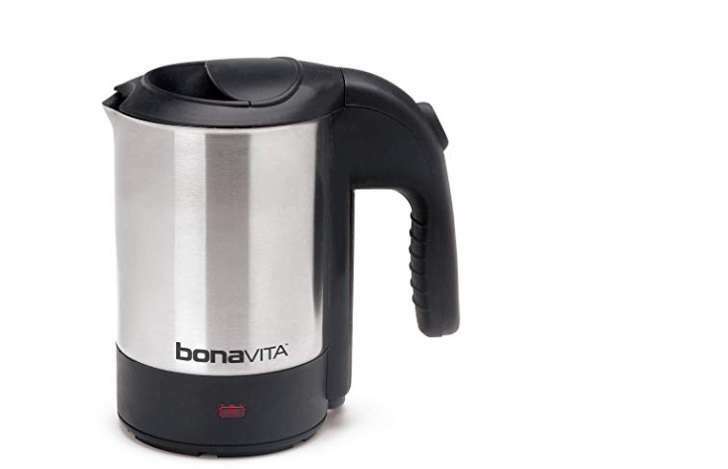 This mini-kettle by Bonavita is a great portable alternative if you typically brew for more than one person, or want to make more than one cup of coffee at a time. It has a 900-watt heater, a cool-touch handle to prevent burning, and an auto shut-off button. Plus, the entire maker has a boil protection built-in, which essentially prevents spills and gets all the coffee where you want it (aka: your mouth, not the coffee maker).